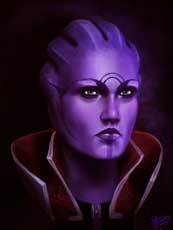 Aria T’Loak is a character in Mass Effect 2 (2010) and returned in Mass Effect 3 (2012) as the de-facto ruler of the Asari capital Omega. Like almost all alien race characters in the ME games she has a quite interesting visual design and personality as well. Unlike the most female characters in the game, Shepard can’t have a romance with her.